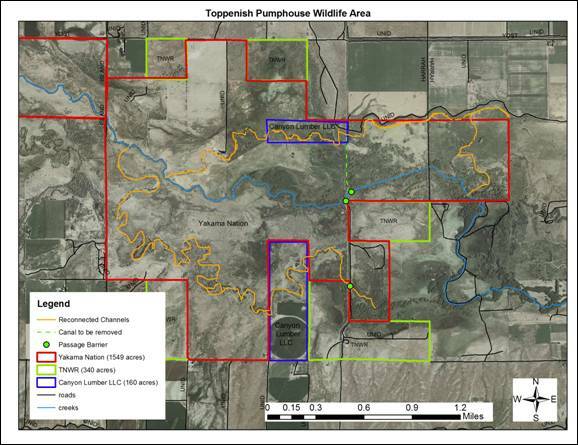 The Toppenish Pumphouse complex is located along Toppenish Creek (20 miles west of the Yakima River) at the intersection of Island and Pumphouse Road 3 miles south of Harrah, Washington. It borders the state Upper Toppenish Creek Reserve and U.S. Fish and Wildlife Service lands. The property occurs within portions of Township 10 N, Range 18, Sections 20, 21, 22, 23, 27, and 28. See Figure 1 below. A portion of this property was originally included into the Wetlands and Riparian Restoration Project in 1999. Acreage has been added to the property since that time. A combination of methods including purchase and long-term lease and easement are being used to secure properties into this Wildlife Area. The property encompasses 1,788 acres of upland, floodplain and riparian habitats. Island Road Wildlife Area encompasses 247 acres and Toppenish Pumphouse Wildlife Area includes 1,541 acres. Approximate area of each habitat cover type, as typed by standardized HEP (habitat evaluation procedures) types used in this project, appears below. 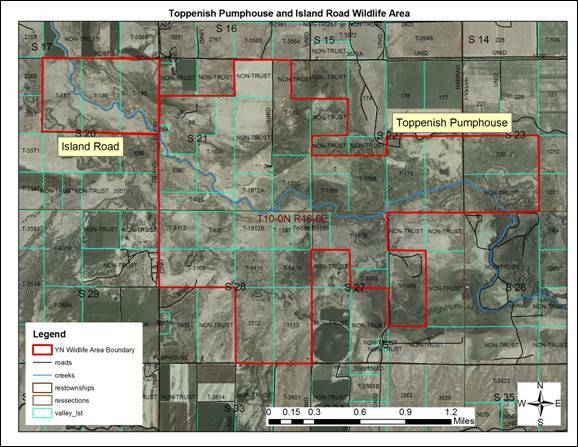 (Note that Island Road and allotments 88, 696, T-1069 in the Toppenish Pumphouse Wildlife Area were not evaluated by HEP and are not included in the below table. Total acreage used to calculate percentages is 1,342 acres). Cover types are discussed in more detail in the Environmental Setting section. Re-establishment of streambed and flow levels to historic levels. This includes re-establishment of the side channels on the property in such a manner that natural flows are allowed to return through the property. Management of water levels in the main channel, side channels, and wetlands to mimic historic hydrologic conditions. Control of noxious weed species that have degraded, or threaten, riparian and floodplain plant communities and their associated wildlife. Restore native riparian and floodplain vegetation assemblages that were present before agricultural use where vegetation has been degraded or converted to other types. Management of lands to provide benefits to wetland and riparian associated wildlife. Management of lands to provide benefits to anadromous fish. This includes the restoration of riparian tree and shrub communities to shade the creek and to provide woody debris for juvenile hiding cover. Provide flow management in the main creek, side channels, and wetlands to allow passage of adult and juvenile salmonids. Manage grazing of domestic livestock to protect and enhance wildlife habitat. Protection of archeological resources identified on the property. Restore culturally important vegetation such as elderberry, chokecherry, golden currant, tule and basin wildrye. 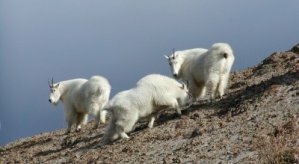 Provide access for traditional resource utilization for Yakama enrolled members, and supervised access for the non-enrolled public for the purposes of small game hunting, non-consumptive wildlife activities, and educational purposes. Creek grade and flow level restoration: This project will repair the middle channel incision, allowing flow to enter the other channels when Toppenish Creek flow increases over the summer minimum. The water in the channels will be allowed to re-hydrate adjacent wetlands that have been dry for decades. 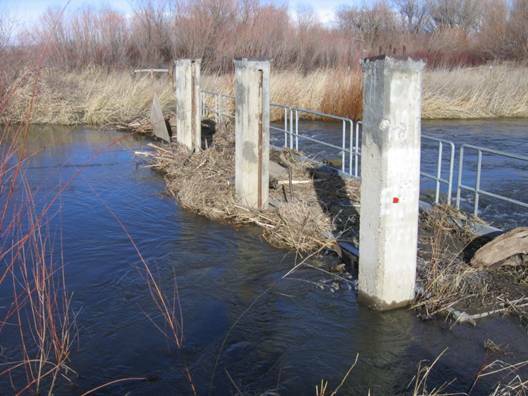 Fish passage will be restored by reconstructing an irrigation diversion dam, removing another dam, and removing any potential false attractions in the reconnected north and south channels. During low-flow periods in summer and early fall, Toppenish Creek cannot sustain three flowing channels. The inlets of the north and south channels will be designed to assure that summer base flow remains in the middle channel. Future removal of the upper dam depends on securing rights-of-way and additional construction to convey return flow and canal spills directly to the Unit 2 pumping station. Reconstruction of the upper dam solves the passage problem for adult steelhead and allows this screened diversion to be used until spills and return flows can be rerouted away from Toppenish Creek. Levee removal, allowing interaction of the creek with its floodplain. Channel and wetland reconnection, and meander development, to carry flow in side channels through areas that were leveled for agricultural production. (Left) Overview of stream channel and flooplain restoration. (Right) Diversion dam, Lower Unit 2, Toppenish Creek. Noxious weed control: Historic cattle grazing has degraded much of the riparian and floodplain habitats present in the property by removing native vegetation and introducing non-native plant species. Many of these weed species are classified as noxious by the state and county Noxious Weed Control Boards. When uncontrolled, these species eliminate native vegetation through direct competition for water, light and space and, in some cases, through strong allelopathic effects which reduce survival or germination of native species by chemicals exuded by the weed species. Noxious weeds also readily colonize moderately or undisturbed areas. Annual control of noxious weeds throughout the Wildlife Area, which include Perennial pepperweed (Lepidium latifolium), knapweeds (Centaurea spp. ), and Russian olive (Eleagnus angustifolia). Figure 14 shows location of recent Russian olive control activities. Intensive treatment of weeds at shrub-steppe/grassland sites selected for native plant revegetation. Selected areas dominated by non-native species that reduce wildlife value, particularly tall wheatgrass (Agropyron elongatum), may be managed with cattle grazing until revegetation with dominant native species can occur (Figure 16). Figure 18 shows the location of areas dominant in non-native species, such as tall wheatgrass (Agropyron elongatum). Areas dominated in noxious weeds, for example, perennial pepperweed (Lepidium latifolium), kochia (Kochia scoparia), reed canary grass (Phalaris arundiaceae), or knapweeds (Centaurea spp. ), will be managed with cattle grazing until revegetation with dominant native species can occur (Figure 17). Figure 18 shows the location of areas dominant in noxious weeds. Native vegetation restoration: Cattle grazing and agricultural practices have altered or removed native vegetation in some portions of the Wildlife Area. In these areas, rehabilitation of native vegetation assemblages is needed. Rehabilitation activities differ for riparian and shrub-steppe (floodplain) plant assemblages. Small food plots consisting of crop cereals have been maintained on the property to provide winter or dry season forage to upland game birds. Food plots are incorporated into restoration treatments, so that planting activities may assist with initial weed control while providing food resources before native vegetation is established. Beaver dams slow water flows and increase inundation periods for floodplain areas. They are considered an important component of riparian vegetation restoration and maintenance. As beaver populations increase on the property to levels that are not sustainable, trapping will be used. Beavers will also be removed when they block culverts or streams threatening roads or flooding on properties outside of the Wildlife Area. Because conditions off-property have been greatly altered, limited animal damage control may be necessary periodically to assist in the restoration of the habitats. Raccoon, coyote, and other predator removal activities may be necessary as well during waterfowl banding activities. Anadromous fish management: Riparian habitat and hydrologic restoration actions have been designed to provide spawning, passage and rearing benefits to salmonids. The maintenance of flow through the channel and wetland complex on the property is critical to salmonid spawning, rearing and passage. Fish management activities will also include revegetation of native riparian shrubs and trees that create shade and provide woody debris for fish habitat. Grazing management: Historic and recent grazing was heavy throughout this property, removing native vegetation in some areas. Currently, grazing is used as a tool to manage non-native weeds in specific portions of the property. Grazing occurs seasonally through lease agreements or from trespass cattle. Cattle will be permanently excluded from sites of critical importance to cultural, wildlife and fish resources. Addressed in Vegetation Management and Infrastructure Management. Protection of archeological resources: In 1999 the property was surveyed for cultural and archaeological resources and a plan was developed to guide project management and restoration activities. Project management activities incorporate protection and restoration of archeological resources. Addressed in Cultural Resources. 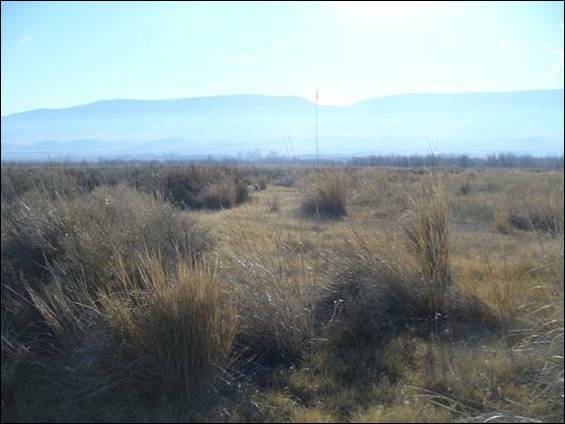 Restoration of culturally important vegetation: With the elimination of grazing pressure, riparian and wetland plants important to the Yakama people have increased. Hydrologic and vegetation restoration will also benefit traditionally important species, which are described in Water Management and Vegetation Management sections. Yakama tribal members for resource utilization (harvest of traditional plants, deer hunting, and furbearer trapping and gathering other foods, medicines and materials). Fee-permitted hunting is allowed for the non-Yakama public for upland game bird and waterfowl hunting during the posted public hunting season. Vehicle access is limited to a portion of the property by locking gates and hunters must proceed on foot. Student and educational groups led by a Yakama Nation employee. Supervised nature observation (plants, birds and other wildlife) supervised by a Yakama Nation employee.